Available in vertical design – NEW! Types “MBT” and “MBE” can be fitted with Pedal or Power assisted hydraulic override to produce a dual-purpose brake. 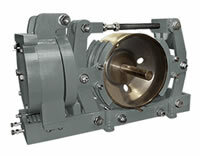 This hybrid mill duty brake is useful for EOT bridges, gantry cranes and similar applications where dual control and/or emergency stopping and parking are required.